CAPECANAVERAL, Fla. -- The pieces are coming together for NASA's next Mars probe, arecon satellite designed to scout out red planet landing sites for futureexplorers. The Mars ReconnaissanceOrbiter (MRO) is awaiting launch atop its Atlas 5 rocket, which is set to loftthe spacecraft toward the red planet on Aug. 10 in a 7:53 a.m. EDT (1153GMT). "It's areal mixture of feelings," MRO project manager James Graf told SPACE.com in the clean room. "We'reelated that we're ready to go launch, but white-knuckled hoping that everythingwill go as we expect." NASAresearchers tout the MRO spacecraft as the largest orbiter aimed at Mars in thelast 30 years. Standing about 22 feet (six meters) tall and spanning 44 feet(13 meters) wide, it certainly outsizes the agency'sother red planet orbiters, Mars Global Surveyor and Mars Odyssey. The orbiterweighs about 4,806pounds (2,180 kilograms), but came in about 112 pounds (51 kilograms)underweight allowing engineers to fill that weight with additional propellant,extending its flight lifetime out to about 2014. 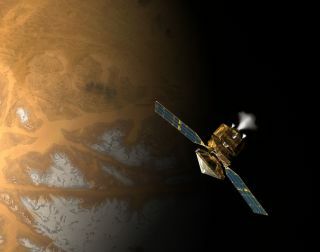 "This is abig mission for us," said Doug McCuistion, directorof NASA's Mars Exploration Program at the agency's science mission directorate,in a preflight press briefing. "It's the most powerful suite of instrumentsever sent to another planet." The MROspacecraft is set to be integrated with its Atlas 5 booster, equipped with aCentaur upper stage, at Launch Complex 41 of Cape Canaveral Air Force Station onJuly 28, launch officials said. MRO willcarry a hefty science payload to Mars, with six instruments designed to trackMartian weather, resolve objects the size of a kitchen table and measure theplanet's composition and atmospheric structure with more detail than everbefore. "The MROspacecraft is many things," said Richard Zurek, themission's project scientist at NASA's Jet Propulsion Laboratory (JPL). "It's aweather satellite, it's a geological surveyor, and it's a scout for futuremissions." The orbitalspacecraft is expected to be the vanguard for two landersNASA plans to launch toward Mars in the next five years, and will identifypotential landing targets. The Phoenix lander iscurrently scheduled to launch in 2007 and touchdown in the planet's polarregion. A large rover, the Mars Science Laboratory, is expected to launch in2009. To preparefor those missions, MRO carries three cameras, one spectrometer, a climate sounder and subsurface radar, all designed to shednew light on the structure and composition of Mars. MRO'sHigh-Resolution Imaging Science Experiment (HiRISE)will photograph Mars' surface with such detail, researchers expect to resolveobjects as small as four feet (1.3 meters) wide. To get a wider view, theorbiter's Context Camera will gather images about 25 miles (40 kilometers)across, with a resolution of about eight kilometers per pixels. A thirdcamera, the Mars Color Imager, is expected to generate a global map of Martianweather and track large-scale dust storms, day-to-day weather conditions, aswell as atmospheric and polar cap changes. "Each daywe will build up a full weather map of Mars," Zuleksaid of the Mars Color Imager. "And [the camera] is the size of a hand." MRO's Compact Reconnaissance Imaging Spectrometer for Mars, or CRISM, willobserve the red planet in the visible and infrared range to pick out mineralsand other materials that may have formed in water or wet conditions some timein the planet's past. The MarsClimate Sounder, an instrument designed to study the changes in Mars' atmosphericcomposition and temperature according to its height. The tool is expected totake measurements every three miles (five kilometers) between space and theMartian surface. Finally, ashallow subsurface SHARAD radar - similar but smaller to one that rides aboardEurope's Mars Express probe - will probe for underground water down to thefirst few hundred feet or so (up to one kilometer) beneath the Martian soil.The MARSIS radar tool aboard Mars Express, on the other hand, will look deeper,probing as deep as three miles (five kilometers) beneath Mars' surface. "The [SHARAD]radar profile will build up a 3D view of Mars," Zuleksaid. Before theMRO spacecraft can cull secrets from the red planet, it must first leave itshome world. Afterlaunch, it should take MRO about six months to reach Mars, thenanother seven months or so to slow adjust its eccentric orbit into a 250-mile (400-kilometer)high circle. The orbiter will use aerobraking to adjustits orbit, swooping in close to Mars and using its atmosphere to slow thespacecraft. Engineers aretaking care not to damage any of MRO's componentsduring the integration with its launch vehicle, including the spacecraft'smassive solar arrays. "These arethe biggest solar arrays every sent to another planet," Graf said. CraigCalvin, an MRO systems engineer for Lockheed Martin, said the orbiter's solarpanels span a total of about 20 square meters and carry about 7,000 solarcells. All those cells are need to generate the five kilowatts of power inEarth orbit, though that power output will diminish to about two kilowatts ofpower at Mars, Calvin said, adding that MRO'sinstruments and equipment only requires one kilowatt to function. "It'sfantastic that after five years, we're ready to go," Graf said. "I'm lookingforward to the first image that comes back from that first pass."